Armenia’s tourism potential has been introduced at WTM London, a vibrant must-attend B2B travel event, on November 5-7. WTM London facilitates £2.8 billion in industry deals and has around 5,000 exhibitors from 182 countries and regions and more than 51,000 participants. 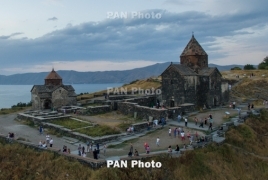 Artsakh (Nagorno Karabakh) and the country’s tourism development agency were also part of the Armenian team of experts. Throughout 2018, Armenian tour operators and industry representatives have participated in six other travel fairs in Iran, Germany, Dubai, China, Japan, including the Profi Travel online fair, where Armenia was named the best country in B2B format.